Taste: Lively and spicy. citrus and lemon, bubbly and butter. Some fudge. Light summer flowers and at the same time malt and soil. Summary: A really really nice dram, love it. It really like the "hand-made" feeling to it. 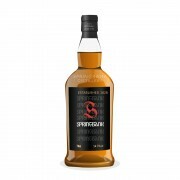 A great long finish that want me to go to Campbeltown and Springbank for a visit. Some nice thick feeling and at the same time light fresh. A great whisky after a great dinner. Note, I tried this one together with a Glenfarclas 21yo and think this one was one notch better. Jens, i totally agree this is a fine whisky. I got to try the 18,15 and CV together a few days ago, and the 15 (which i own) is really nice. the 18 was amazing too. 46% is a really good point for OB. slainte! and enjoy your holiday!